“We seek to consistently generate positive absolute returns over the long term, and believe that preserving capital is the foundation for growing wealth." Based on current and prospective economic conditions, the HWM Investment Committee incorporates several proprietary technical and fundamental market research strategies to select broadly diversified asset classes with the potential to outperform their long-term averages. Our investment process is designed to manage risk across various strategies, striving for lower overall volatility and the prospect of increased returns. To supplement our comprehensive analysis, the committee often taps insightful outside information to help augment or, in some instances, challenge a particular strategy. This insight also aids in the development of pending allocation models. As an independent Registered Investment Advisor, we utilize a wide variety of investments and are not tied to any specific companies, thereby allowing an unbiased approach to both construction and execution. Our well-diversified portfolios are crafted using an actively managed Core and Satellite strategy that varies from traditional asset allocation models which proved ineffective between 2000 and 2010. Core and Satellite investing seeks to combine the best of both worlds—preservation of principal and opportunity for growth—by wisely incorporating active and passive investments. The Core, comprised of quality, long-term investments that lend stability and diversification, and the Satellite, invested in opportunistic selections that provide potentially greater returns to the overall portfolio. The relative allocation of the Core and Satellite strategy within the portfolio is contingent upon investment objectives, circumstances, risk profile, and financial market conditions. This balanced approach spreads risk among a number of investments, potentially reducing volatility while producing above average returns. Working in synergy, Core and Satellite selections deliver the benefits of investing in a broad variety of asset classes with the potential to outperform any type of market over the long term. Along the way, this strategy offers the flexibility to make timely changes, alter strategy, or narrow our focus in an effort to preserve and grow your portfolio. The Core of your investment portfolio acts as a foundation expected to yield positive, stable returns over the long term. The Core, forms 20% to 100% of the portfolio and is comprised of carefully selected investments structured to address your risk tolerance profile and minimize losses during a downturn in the financial markets. 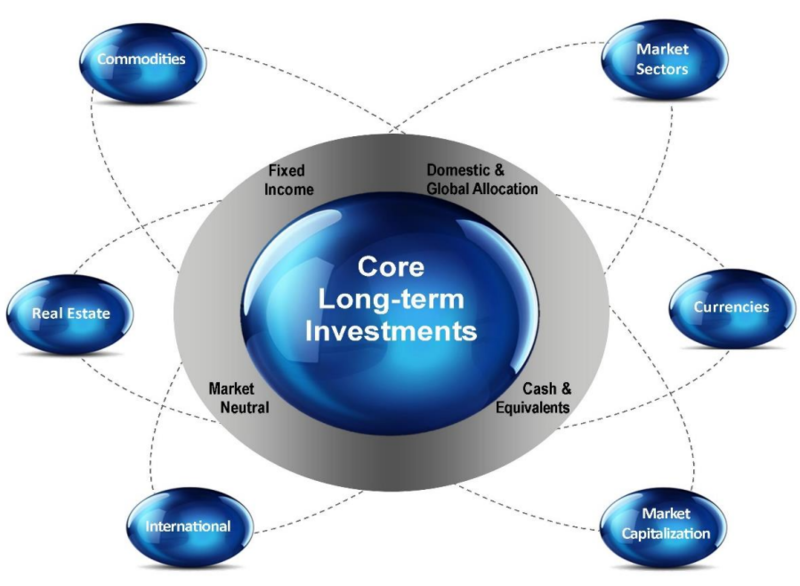 Although Core investments are designed to be held for the long term or until maturity, they are actively monitored and may change based on market conditions and technical indicators. Core investments can act as a buffer should market conditions worsen. Satellite investments potentially yield higher returns when market conditions improve. Careful investment management strategy shifts allocations toward either the Core or the Satellite based on research and market conditions.